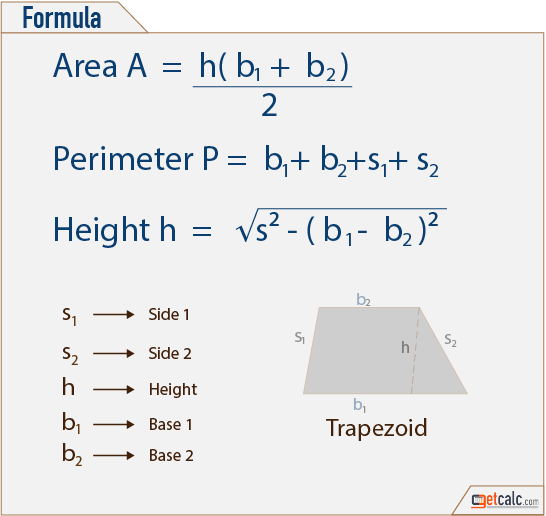 getcalc.com's trapezoid calculator is an online basic geometry tool to calculate area & perimeter of trapezoidal plane or shape, in both US customary & metric (SI) units. Trapezoid is a two dimensional plane or geometric shape represents quadrilateral with either no sides parallel to each other or with only two sides are parallel to each other in SI & US customary units measurements. The parallel sides and other two sides are called the base and lateral sides respectively. K-12 students may refer the below formulas to know what are all the parameters are being used to find the area & perimeter of trapezoid. Below are the practice problems for grade school students, on finding what is the area and perimeter of a trapezoid. By click on the corresponding problem shows the step-by-step calculation or work with steps for how to find such values of trapezoid mathematically. For any other similar values, use this trapezoid calculator to verify the results. Find what is the area and circumference of trapezoid whose length of base one is 6 inches, base two is 5 inches, side 1 is 7 inches, side 2 is 9 inches and height is 8 inches? What is the area and perimeter of trapezoid, if it has side 1 = 12 inches, side 2 = 16 inches, base 1 = 11 inches and , base 2 = 15 inches?